In what appears to be a cyclical recurrence of post-success litigation, Snapchat is being sued by a man from South Carolina named Frank Reginald Brown IV, who claims that he originally came up with the idea for the ephemeral picture messaging app. The idea for Snapchat is simple, yet has been widely misunderstood by older generations: you take a picture or video of yourself (or something else if you choose), set a time limit, and send the picture off to a friend. The app will only let the user view the picture for the pre-set period of time, no more than ten seconds. Brown and his lawyer, K. Luan Tran, claim that Brown conceived of the idea for Snapchat, and co-founders Evan Spiegel and Bobby Murphy called it “a million dollar idea.” The L.A. Times reports that, after working on the app together all summer under the name Picaboo, Spiegel and Murphy changed passwords to the servers and shut Brown out. Brown even claims that he came up with the ghost logo that is still being used today. 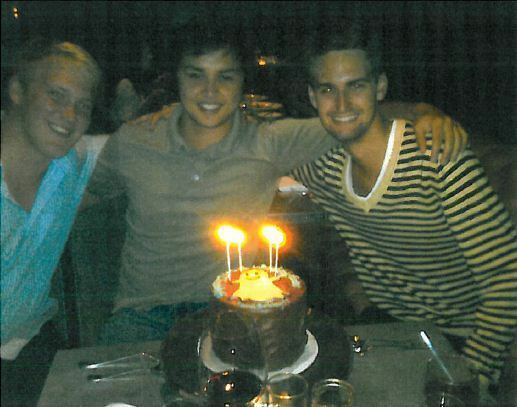 A picture posted by the L.A. Times appears to show Brown sitting with Snapchat co-founders Evan Spiegel and Bobby Murphy over a cake with the yellow Snapchat ghost logo frosted on. This doesn’t prove or disprove anything except that the trio knew each other, but it’ll clearly take a court case to get to the bottom of all of this. However, it is interesting that the Snapchat logo (which never fully made sense to me) seems much more suited to a name like Picaboo. Luan Tran, Brown’s lawyer, claims that Brown is looking for restored rights and any damages he may be owed. It’s also worth remembering that Snapchat just closed a solid Series A round — $13.5 million led by Benchmark Capital, to be exact. It wouldn’t be the first time that a college project among classmates has turned into a multi-million dollar business. And we all know, where there is money, there will be blood. We’ve reached out to Luan Tran for comment, but he has not immediately responded.